Have you ever been on holiday and the taxi driver asked to much money for the drive from the airport to your hotel? Or you are paying absurd high prices for products the local pays only 10% ? In the Netherlands we have the tulip bulb scams. It might be not as visible but for a lover of spring flowers like me, it hurts a lot that affects mainly tourists. They buy tulip bulbs during winter, spring and summer time and these bulbs are not going to bloom at all. Tulips and other spring flowers like daffodils, hyacinths and crocus are normally sold during their planting season in Autumn. They are harvested during the summer months and the fresh bulbs are sold to buyers and these buyers put them into the ground in the same autumn. Than the tulips need a time in cool weather for a couple of weeks, good winter temperatures, like the temperature in the Netherlands. After winter they bloom in springtime and when done blooming they are harvested during the summer months and the cycle starts all over. Unfortunately not everybody knows this. So the leftover bulbs are sold to whoever they want to buy. For instance a lovely couple who visited me from abroad last weekend. They wanted to buy tulip bulbs to take home to. When they buy bulbs now, they have been harvested during the summer months and they have been out of the ground for at least half a year. They live in Europe so the planting season is next autumn is 7 months away. That means that the tulip bulb is out of the ground for more than a year. What happens when you don’t give your plants/flowers water or nutritions for more than a year? Yes they die, so will bulbs. They become dry and moldy from the inside. So when it looks like a lovely idea to buy tulip bulbs this spring. Don’t do it. They won’t grow or bloom, it is a waste of your money. Instead order your tulip of your choice at a bulb farmer (find them online) and they will be happy to help you. Yes, that means that you can’t take them home right now. But they surely will bloom next spring. Out of this world tulip: Selling beautiful blue tulips, you can see it on the photo attached to the package – blue tulips only exist by painting or photoshop. There are no blue tulips by nature. When there is, you will read it here. Just like everywhere else if it looks to good to be true, it is not true. The switched tulip: Selling a lovely special tulip bulb you have been looking for in every shop – and at home it is just a regular yellow/red tulip you have seen 100 times already. The “accidental” mix up. But you have paid for the special one. What are you going to do? Do you have the address of the seller ? Tropical tulips: Selling tulip bulbs to people who live in a very warm and tropical climate. Do you have a wintertime with cold temperatures below zero degrees? No ? than the tulip won’t grow/bloom in your garden. Buy your tulip bulbs in the right time at the right place. The right time for buying real bulbs is autumn – September, October and November in the Netherlands. If you want to make sure you have a special bulb pre-order them. The right place a respected tulip bulb seller, find them online or ask your local garden nursery for help. Lots of respected tulip bulb seller will tell you when it is out of season, that you can order the bulbs and that the bulbs will be delivered at your home during autumn. Please stay away from anyone who sells bulbs out of season anywhere between Januari and August. Yes that includes springtime. The spring flower bulbs are in the ground at that moment and harvested during next summer. But be aware these sellers will tell you beautiful stories. Yes, of course this bulb will bloom, yes it is a fresh bulb and yes this is a very special bulb. Anyone who sells you real tulip bulbs outside of planting season is scamming you. And you will find a lot of shops, markets, souvenirs shops or pop-up shops along the roads selling tulip bulbs and other spring flowers bulbs during springtime. So it all looks like buying tulip bulbs during springtime is a great idea, it is available every where. But it is not a great idea, you are scammed. But don’t take my word for it. Just do a google search and find out how a tulip grow, its planting cyclus, etc. And search again for respected tulip bulb sellers. If you find one try to order a bulb at springtime, you will see the text “out of season” or “delivery next autumn”. If tulip bulb sellers, who knows everything about tulips, won’t sell bulbs at springtime why would you buy them at a scammer? It is a waste of money. These tulips are not going to bloom ever. What about the other bulbs that are sold during springtime? At springtime it is the planting season for summer bulbs. And that causes a bit of confusion for people who are not regular gardeners. Bulbs like: Dahilas, Ranunculus, Begonias, Gladiolus, Lilies, Calla Lilies, Oxalis, Cannas, Caladium, Elephant Ear are ok to buy during springtime. You put them right in the ground when you get home. Just make sure you are not buying from a scammer that sells you last year’s bulbs! Buy from a respected bulb seller, also counts for summer flowers. Have you ever encountered a tulip bulb scam? Leave a reply at the comments. If, after planting tulip bulbs in the spring, you got no flowers, don’t assume they are completely dead. In fact, the bulb may just need another fall and winter to build up enough nutrients to bloom next spring. Do you know about the free bulbs package worth € 3.95 included within the Combi ticket for Keukenhof with train + bus + entrance? Do they have other flowers or tulips? I guess if they are tulips they will be useless and that’s why they are free. Sorry for the stupid question! I am sure that there will be no tulip bulbs package included in the combi ticket. 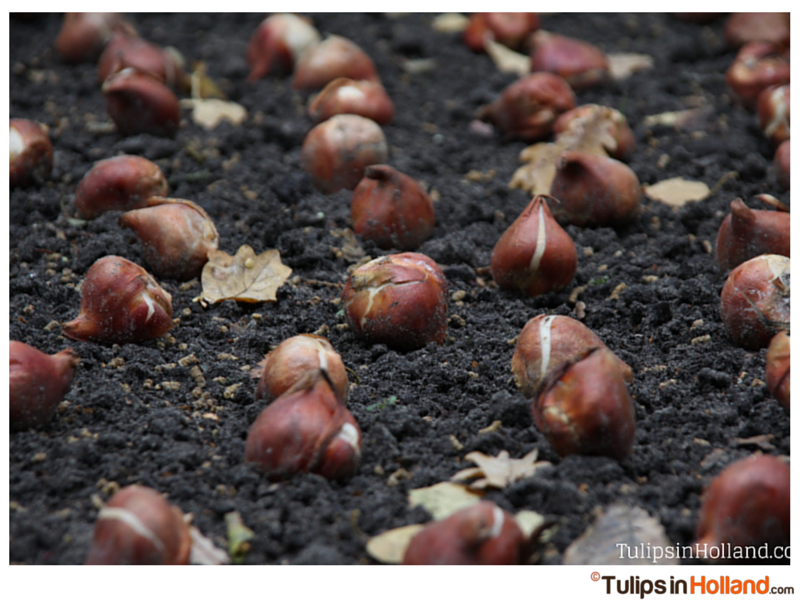 See http://tulipsinholland.com/2015/02/tulip-bulb-scams-dont-buy-tulip-bulbs-springtime. The only bulbs you can buy now are summer bulbs. Have a wonderful time visiting Keukenhof. What bulbs can I buy now. I live in South Africa in an area with a very mild climate. Obviously tulips will not grow there! I should have known better. I’m currently studying in Holland, and I wanted to send my mother something “Dutch” for her birthday. Late April. A friend suggested tulips. I stopped at a florist shop outside the central station in the Hague. Purchased several packages of bulbs and the girl at the counter gift wrapped them for me. then I took them to the post and shipped them home. Pfft. When I spoke to my mother later, she sadly informed me that the bulbs were rotten when she opened them Only after that did I read up and learn that bulbs are planted in the fall and not sold by reputable dealers in winter and spring. My husband just bought me bulbs from a flower shop in Amsterdam. We live in the PNW, and planting season is Autumn. What a bummer. He even got me blue tulips! The thought that counts though. Hi Nienke. Thanks on the updates and particularly for the education on buying tulip bulbs, What you said is true about the sale of bulb with picture label – I bought 4 amaryllis bulbs from Bloemenmarkt in Amsterdam..I took some time to decide on the colour and variety and then choose the bulbs carefully. They were supposed to be 3 different varieties (2 of which was same variety) but haha… when they bloomed, it was all the same colour and variety. False marketing! And yup, we were kinda disappointed since we waited eagerly to admire the different varieties. Great article and very valuable. I will be in Amsterdam and Keukenhof in a month (my 2nd trip) and was planning on buying bulbs for my daughter. Instead, I will get the alternatives you suggested at the end of your article. Can anyone suggest a reputable bulb dealer in Amsterdam, like at the flower market? Can I get these summer bulbs at Keulenhof?